A beautiful sunrise over the hills of Jerusalem greets us as we start our day. We begin in the walled city of Jerusalem, in the Muslim quarter, walking in through the Lion's Gate, also known as St. Steven's Gate. The Green gate of the Temple Mount is inaccessible to us as non-Muslims. Indeed as we approached the gate, police officers warned us off and would not allow us to approach any closer than about 10 meters from the gate. Nearby, St. Anne's church is one of the most beautiful churches in the city of Jerusalem. The acoustics of this Crusader-era church are excellent, as demonstrated by several tour groups who sang songs in the church. Our group sang Amazing Grace and Silent Night, our voices reverberating majestically throughout the building. The Via Dolorosa, also know as the Way of Sorrow or the Way of Suffering, is the traditional path over which Jesus is believed to have carried his cross on the way to his crucifixion. 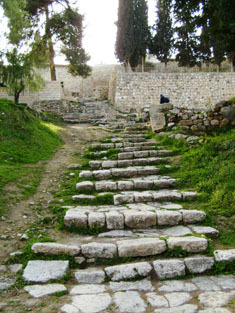 Although the exact path that Jesus walked is not known, he quite likely walked on or near the path that is mapped out in the guide books. I found interesting the juxtaposition of the hectic modern market atmosphere with the ancient streets and sites along Via Dolorosa, many of which are held sacred by many Christians throughout the world as the path that their savior took to his death. But perhaps the Via Dolorosa was just as hectic, crowded and commercialized in Jesus' day as in the 21st century. Much of Jerusalem sadly seems to be oriented toward consumption and religiosity, rather than sincere spiritual living. 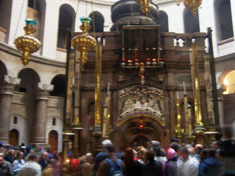 The Church of the Holy Sepulcher is the place which is traditionally believed to be the burial site of Jesus. A number of denominations observe a strict protocol for worship at this location; these groups include Latin Catholics, Greek Orthodox, Armenian Christians, Syrians, Copts, and Ethiopians. It seems to me that the exact location of Jesus' burial is perhaps less important than the fact that millions of Christians have a definite place upon which to focus tradition, prayer, and celebration. After lunch we headed towards the Jaffa Gate. 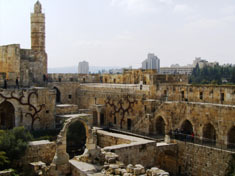 There, the Tower of David museum has a splendid set of exhibits that takes us through the timeline of the history of Jerusalem. This was probably the most comprehensive treatment of the subject of Jerusalem history that we've experienced thus far. To do justice to this museum would probably take at least a full day--so this is one place we'll need to re-visit when we return to Israel. The house of Caiaphas is where Jesus is believed to have been imprisoned and beaten on the day he was crucified. Caiaphas was a high priest who was no doubt threatened by Jesus, and was not the kind of guy most of us would want for a friend. Caiaphas had facilities for collecting grain and other commodities from citizens, and a dungeon prison and torture chamber built into the basement of his house. Historians also believe it was at the house of Caiaphas that Peter the Apostle denied three times knowing Jesus. The church there is known as the Church of St. Peter in Gallicantu. The tension between the ethnic groups in Israel is evident in Jerusalem. While walking though an Arab neighborhood we saw two young Arab boys no older than five years of age who, upon seeing our group come around the corner, immediately trained their toy rifles upon us, firing ersatz rounds at us with grim determination. One has to wonder how and when the cycle of hatred can be broken, especially when seeing such young children already taking on a mindset of violence toward their neighbors.